At 9pm after Emma has gone to bed and Mike and I are winding down we're always in the mood for something sweet. Last week, I really wanted just a bite (or two...) of freshly baked, hot and bubbly, crumbly peach cobbler topped with vanilla ice cream. Who wouldn't? I whipped up a mini guy for us to share and put the rest of the crumb cobbler topping (I had made too much...) in the freezer. Perfect - next time I have a craving and have a couple of peaches (or apples or berries...) lying around, I can just grab a handful of topping from the freezer. In the bowl of a mixer fitted with the paddle attachment, add flour, sugar, brown sugar and salt. Stir together. Cut butter into small pieces (about 1/2 inch cubes) and add them to the bowl and mix on medium low for a few minutes until the mixture starts to come together and is a crumbly texture. For this size, bake at 350 degrees for 10-15 minutes until the filling bubbles and the topping begins to brown. To peel peaches easily, drop them in a pot of boiling water for 30 seconds, then put them in ice water. The skins will peel off easily with the help of a pairing knife. These Individual Peach Cobblers are part of my Fresh & Flavorful Father's Day Menu - get all of the recipes here! This looks outrageous!! I love anything to do with peach and this looks incredible. I just came home with a fresh bag of peaches. Now I know what to do with them. Thanks for the idea! I ran into your blog thanks to Pinterest, and all I can say is that I am in love with it! Thanks for sharing! will be his Fathers Day dessert. 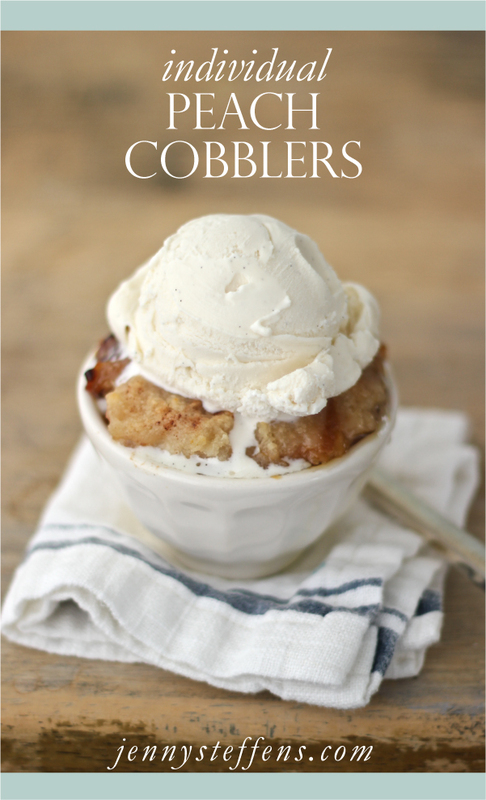 That cobbler looks delish! The rest of your Father's Day menu looks so tempting, too! Thank you so much for sharing such beautiful recipes that you truly care about. They make me inspired and believe that wonderful beautiful bakers are out there. I cant wait to become one! I've used your tip for easily pealing peaches twice, works like a charm! Hi Jenny, my name is Teresa. I love your blog, I never comment on anyone's blog except my daughters. Thank you for sharing your peach cobbler!! My favorite! Now my hubby and I can make just enough for the two of us.